A high quality George II mahogany box toilet mirror having the rare feature of a carved cresting. In totally original condition including the mirror plate. A carved gilt wood mirror the shaped plate surrounded by a strongly carved frame variously decorated with scrolling acanthus and motifs alluding to water. Circa 1735. This mirror is en suite with table T5. 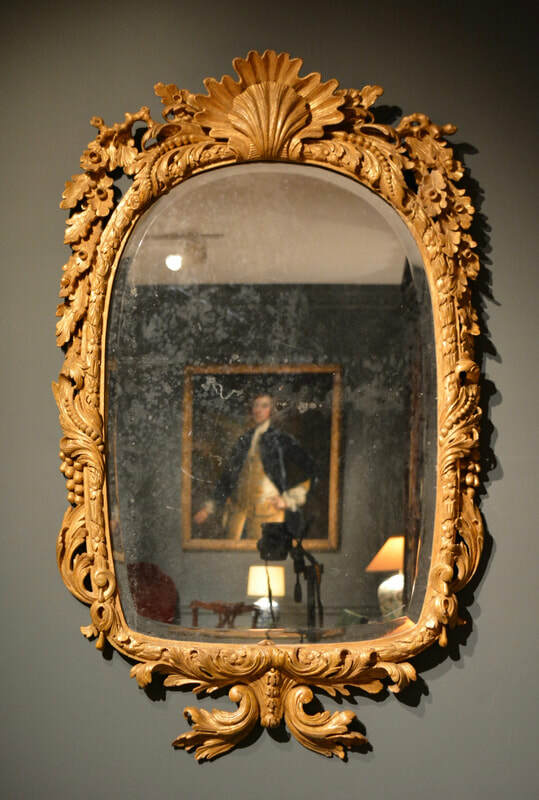 A rare early 18th Century giltwood overmantle, the top frame of ogee gothic form, retaining it's original mirror plates with their decorative bevelling and cutting. Circa 1725. A finely carved gilt gesso mirror having candle arms to the base. Circa 1720.